NC State redshirt freshman Devin Leary is competing for the starting quarterback job, and he understands that the best man is going to win. For him, his confidence comes from the discussions he’s had with the coaches. There has been a lot of turnover around the quarterback position at NC State. 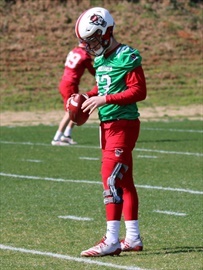 Gone is three-year starter Ryan Finley, one of the top passers in program history. Also gone is Eli Drinkwitz, who not only served as the team’s offensive coordinator but coached the quarterbacks, as well. Devin Leary is excited about playing in the upcoming spring game. New quarterbacks coach Kurt Roper doesn’t have OC duties, which should give him even more time to spend developing the Wolfpack’s young signal-callers. The group has completed spring practice, a journey that will truly end on Saturday with the 2019 Kay Yow Spring Game. Leary, who redshirt in the fall, knows what he is looking forward to the most. 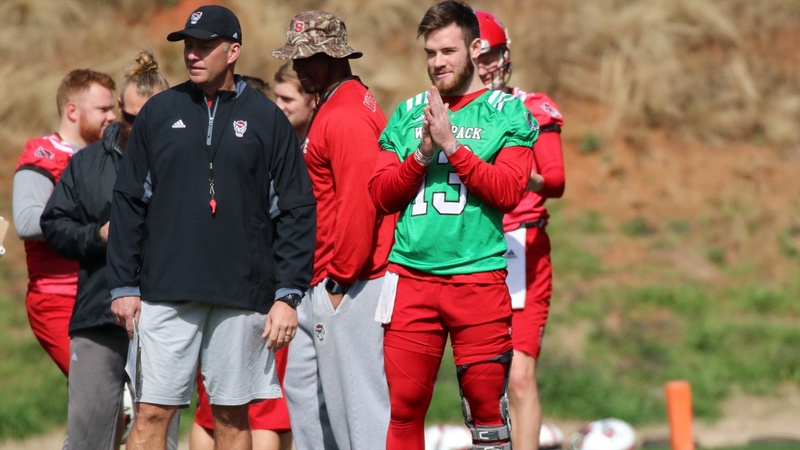 Obviously the quarterback competition won’t be complete until fall camp, but the spring game is a big stage because the players have a chance to impress not only their coaches and teammates but also Wolfpack fans. Whomever the next Wolfpack quarterback is – whether it’s Matt McKay, Devin Leary, or Bailey Hockman – he will have huge shoes to fill. Not only will the eventual signal-caller be stepping in for Finley, but NC State has one of the richest quarterback traditions in the country when you consider four NC State alums are currently taking snaps in the NFL in Philip Rivers, Russell Wilson, Mike Glennon, and Jacoby Brissett... with Finley about to join them. Does that put added pressure on the current quarterbacks? “I don’t look at it as pressure, I look at it as opportunity,” Leary replied. “The guys before have set a high standard, Ryan, Jacoby, Russell Wilson, Philip Rivers, Mike Glennon.